In a suburb of Paris in the 1920s, Marcel (André Dussollier), a celebrated concert violinist, is visiting Pierre (Pierre Arditi), an old friend from their student days at the Conservatoire, and his high-spirited wife Romaine (Sabine Azéma). After dinner, Marcel recounts the story of how he discovered the great love of his life had betrayed him. Romaine is so transported by Marcel’s story that she instigates a clandestine meeting between them the following day. So begins a passionate affair that will ultimately tear all their lives apart. Mélo is bookended by two extended monologues, each shot in one continuous moving take. In the first, violinist Marcel (André Dussollier) recounts to his old friend Pierre (Pierre Arditi), and Pierre’s wife Romaine (Sabine Azema), how years before, while playing in a concert in Havana, he noticed his mistress Hélène making eyes at another man. This experience, he tells them, left him unable any longer to believe in a love of total trust. In the second, some time after Romaine has committed suicide following a secret affair between herself and Marcel, Pierre recites by heart the letter she wrote to him before she drowned herself in the Seine. Director Alain Resnais orchestrates these two suspended moments like a master conductor, subtly changing the lighting as the camera tracks around into close up on the actors who deliver their speeches with the virtuosity of master musicians. Resnais had always been fascinated with music, collaborating closely with such important composers as Darius Milhaud (Guernica), Hans Werner Henze (Muriel), and Miklós Rózsa (Providence) throughout his career, and in Mélo, a film about musicians, he creates the filmic equivalent of a musical chamber piece – precisely controlled, yet emotionally intense. Henri Bernstein was a successful French playwright in the early decades of the twentieth century associated with ‘Boulevard Theatre’. The name derives from a popular style of play performed in theatres along the Boulevard du Temple in Paris beginning in the late 19th Century. The writers of these middle-brow comedies and dramas tended to avoid the grand themes intrinsic to the high-brow or upper-class theatre, preferring instead to portray simply-drawn characters speaking realistic dialogue. Thirty of Bernstein’s plays opened in Paris between 1900 and 1952, and all were successful – the original production of Mélo opened in 1929 with Charles Boyer as Marcel and Gaby Morlay as Romaine and ran for some five hundred performances. Yet in the years since Bernstein’s death in 1953, and the 1986 film of Mélo, his work had fallen out of fashion and his name had largely been forgotten – but not by Alain Resnais. In an interview, the director recalled that he was not allowed to see the play as a child, but that his parents brought him back the programme, and his adaptation was an attempt to recreate the play he would have wished to see. Perhaps unsurprisingly, eyebrows were raised in some quarters when it was announced that Resnais, one of the doyens of serious art cinema, was planning to adapt the work of a playwright considered conventional and out-of-date. Yet Resnais had always adored the theatre and Mélo is, on one level, an homage to both the kind of well-made play that Bernstein excelled in, and to the experience of theatre-going. Resnais chose not to try and update the material for modern tastes, but rather to capture it as it would have been performed at the time it was first written. Thus the film opens with a hand turning the pages of a programme to reveal stills of the cast before a red proscenium curtain opens to signal the start of the performance. The first scene, or act, though it takes place in the ostensibly realistic setting of Pierre and Romaine’s garden, seems a little too picturesque to be real. Then you notice the painted midnight blue of the sky above and become aware that this is being shot inside an enclosed studio set. It’s as if Resnais wants not so much to transform our experience of the play through cinematic means, as for us to enjoy the best of both mediums simultaneously. As well as evoking the world of the theatre, Resnais and production designer Jacques Saulnier conjure up a vivid depiction of the Art Deco era. They had recreated a similar period on a much grander scale some ten years earlier in Stavisky (1974), but this time the settings – Pierre and Romaine’s house, a nightclub, and Marcel’s apartment – are simpler, yet no less redolent of the time depicted. The latter location, Marcel’s stylish penthouse apartment, in particular, epitomizes a certain kind of twenties Deco aesthetic, reflecting both his status and his ivory tower detachment from the everyday world below. The interior of Pierre’s house, by contrast, is cluttered but homely, full of books, ornaments and other bric-a-brac in keeping with his easy-going, unpretentious personality. Romaine, with her flapper dresses and kooky personality, flits back and forth between these two worlds, at home in both, yet restless and unable to settle in either. Love triangles and their consequences recur frequently in French cinema from Jacques Becker’s Casque d’Or (1952) to François Truffaut’s Jules et Jim (1962), Claude Chabrol’s La Femme infidèle (1969) to Jean Eustache’s La Maman et la putain (1973). Even Resnais himself had explored such a relationship in his famously cryptic L'Année dernière à Marienbad (Last Year at Marienbad, 1961). Marienbad, like much of Resnais’ work received a polarized response when it was released from critics ranging from actor and surrealist Jacques Brunius’s declaration that 'Marienbad is the greatest film ever made', to Pauline Kael’s dismissal of it as an 'aimless disaster'. A common accusation made by his detractors was that Resnais valued form over content, that his films were coldly intellectual, confusing, and lacking in emotional empathy. 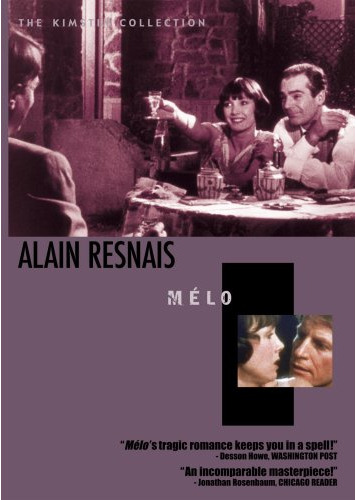 Though highly unlikely that he intended it that way, Resnais’ Mélo is the perfect riposte to such criticisms. There are no alienating editing techniques or abrupt time shifts here. Instead Resnais tells a linear story with authentically real human characters, employing mise en scène to showcase the acting performances to maximum effect. The performances by Mélo’s quartet of lead actors are remarkable for their depth and subtlety. As Michel Blanc, Dussollier is diffident yet intense, introspective yet passionate. Wounded in love, he wins our sympathy with his eloquent tale of betrayal, only to commit his own act of betrayal in turn. He seems as puzzled by his own contradictions as we are. Sabine Azema won the César Award for Best Actress for her electrifying portrayal of Romaine whose desperation for some kind of all-consuming passion, driven perhaps by her own physical frailty – ‘her lungs are weak,’ Pierre informs Michel – drives her to initiate an affair against her own better judgement. The harrowing scene in which she desperately tries to cover up her attempted poisoning of Pierre is distressing to watch, not least because of his unshakeable trust in her. Pierre and the faithful Christiane do not share Michel and Romaine’s inconsistencies of character – both might be described as open books. In the final scene, Pierre Arditi – a deeply sympathetic screen presence who won the Best Supporting Actor César for his performance – carries the tragic consequences of Romaine’s recklessness in his haunted countenance. All the playfulness he shared with her earlier has been replaced by world-weary resignation. Only Christiane – played with typical strength of character by Fanny Ardant – knows the full truth and has the discretion to keep it to herself. Mélo’s enigmatic ending leaves a number of questions unanswered. Why, if Romaine loves Marcel so much that she is willing to leave Pierre for him, does she write her suicide letter to Pierre? And why does the letter explain nothing of why she did it? And does Pierre believe Marcel’s denial, or does he only pretend to do so? We can wonder, but Mélo, like Last Year at Marienbad, is a mystery without a resolution. When it comes to human beings, the film suggests, logic cannot explain the mysteries of the human heart. Only music has the capacity to console the inconsolable. And so it is that Marcel and Pierre turn to music as they perform their favourite Brahms sonata together one last time before the final curtain falls.